Obi Hornbill is a affordable android smartphone with 13MP Auto Focus rear camera with flash, 5MP front camera, Android KitKat 4.4.2 and 18 regional languages support. 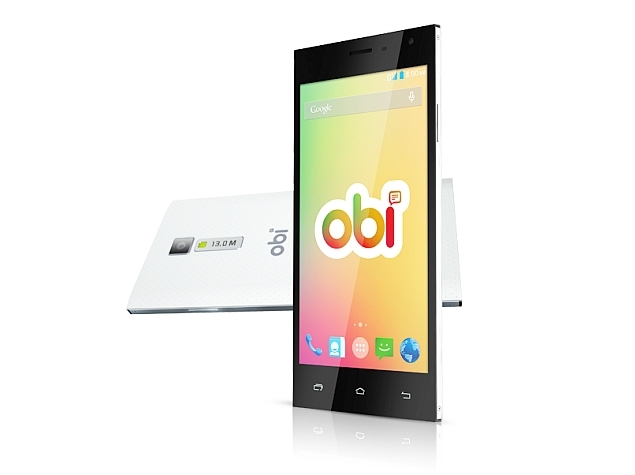 Obi the established mobile brand is geared to launch the much-awaited Hornbill S551. Hornbill is a slender attractive looking phone with a shockingly looking colourful display, and it is the next affordable smartphone craze in the market. Obi Hornbill is attractive at first sight; it is one of those fashionable slim phones that is easy to carry around. Its appearance is enriching and colourful, it is a dual SIM phone and supports Micro SIM and Standard SIM and 3G connectivity. It is a touch screen phone that has volume and power key and measures 156mmx76.8mmx7.9mm. If the sight of tall, elegant and vibrantly colourful displays fascinates you, Obi Hornbill is just perfect. Its 5.5 inch screen size measurement is among the best in its class. The rich vibrant screen presence is contributed by the impressive 1280×760 pixel resolution capacity and 267ppi pixel density. The advanced technology behind the enriching colourful display is the TFT IPS screen with innovative capacitive touch. The colour emitting power of Obi Hornbill is magnificent, and the emission capacity is 16M. It has Multi touch facilities. The camera quality of Obi Hornbill is impressive, and users can enjoy high-end lens technology in a budget phone. It has a primary 13MP camera that supports a multitude of operations such as Auto focus, LED flash and 4X zoom. The front 5MP camera is also pretty potent, the camera operation power is versatile, and consumers can capture several images at a shot contributed by the 30 fps recording interval at 1080p resolution. 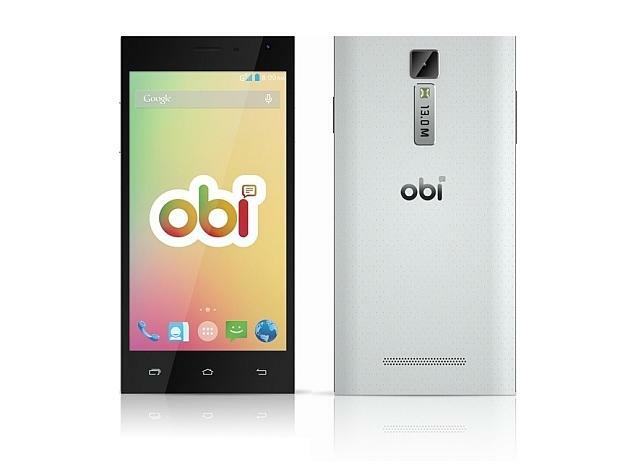 Obi Hornbill is powered by a 1.3 GHz Quad core processor, with Mali 400 GPU MP2 GPU and MediaTek MT 6582 chipset. The hardware power of the phone is first rate and owners can effectively perform multiple operations in a short time interval. It is an ideal phone to carry out efficient business operations and for recreational purposes. Consumers can afford to use their Obi Hornbill phone for hours and not bother about battery drainage. It runs on a revolutionary 3.7V Li-ion battery that is removable, and the battery operation capacity is 2200mAh, which means owners can talk on the other end for maximum time frame of 8 hours. The extended durability of the battery is created by EU type of charger, 1A current output, 5V DC current, 200 hours of standby and 110-240 Voltage. Obi Hornbill functions on Android 4.4.2 KitKat software, which is enormously advanced for its price. It supports efficient browsing and audio, the browsing software incorporated into the phone is 2.0 WAP that is a standard Android browser. The effectual audio processes are caller group, WAV ringtones, 3.5mm jack, and loudspeaker and FM radio. Using the Obi Hornbill phone is convenient; it has all the facilities needed for resourceful daily usage. The screen supports a range of apps such as Play store, maps, Gmail, messaging, phone book, social networking sites such as Facebook, WhatsApp and so on. The available messaging facilities are IM, push mail, Email, MMS and SMS, the powerful sensors infused into the phone are Ambient light sensor and gravity sensor, and the devise supports only white colour option. Obi Hornbill is a proficient phone, and is packed with state-of-the art features, what about the usage output and day to day handling experiences. Let’s dig into some more captivating details of the devise. Use your phone to any given length in a day: Obi Hornbill can support hundreds of apps, contributed by the versatile 1.3 GHz Quad-core processor that supports 1GB of RAM. The app downloading process happens swiftly and efficiently, and is a proof that the reasonable Obi Hornbill phone can live up to the expectations of a high-end piece. Flexible Operator: Obi Hornbill runs on an efficient 4.4.2 Android KitKat operating system, it has a dynamic screen presence that emits world-class colour resolution and is vibrantly attractive on its impressively huge 5.5-inch screen. The communication power of the devise is creditable; it has Hangouts app and automatic contact prioritisation that enables efficient at a swift pace. With just an aid of Ok Google tab, you can play music, text and even browse the net. Innovative touch screen technology: Obi Hornbill is engineered with a powerful IPS HD 13.97cm touchscreen that enables spectacular image and video quality. The nature of images is mind blowing and the resolution is stunning, it is a perfect devise for ardent photography fans to capture fascinating architecture and awe-inspiring scenery. It is also an ideal devise to capture life-remembering vacation moments and parties. Excellent camera technology: The versatility of image capturing and recording is par excellent contributed by the 5MP front camera and 13MP rear camera built with Auto Focus technology. Users can record tons of captivating videos and store the memories cherished with friends and families, created by the world-class playback and HD recording. Dual SIM: The dual SIM feature of Obi Hornbill makes life increasing convenient. Users can store two numbers; one can be used at home city and the other for travel purposes. Multiple apps: Obi Hornbill supports several apps and users can engage in fun-filled browsing, social networking, music and gaming encounter. Some of the amazing apps are Hangama to immerse into some delightful and soothing music and Truecaller that comes in handy during emergencies, using these app users can source or find information about anonymous phone numbers. Optimum Convenience: The touch screen encounter with Obi Hornbill is exceptionally flexible, and everything happens with just a small tap of the finger. There are pre defined gestures that enable swifter operation, and one the green itself there are alphabetical gestures like s for settings, m for music, e for browser and c for call log. Range of languages: Obi Hornbill is language friendly, it supports as many as eighteen regional languages, which makes life more convenient and gives an opportunity for people to explore their mother tongue and also get acquainted with other Indian languages. The Hornbill from Obi is priced around Rs 8500. Next: Are Smartphones and Tablets Going to Replace Desktops and Laptops?